I'm calling it quits early today! I have a friend in from San Fransisco and we have a dinner date! but things are moving in the right direction. 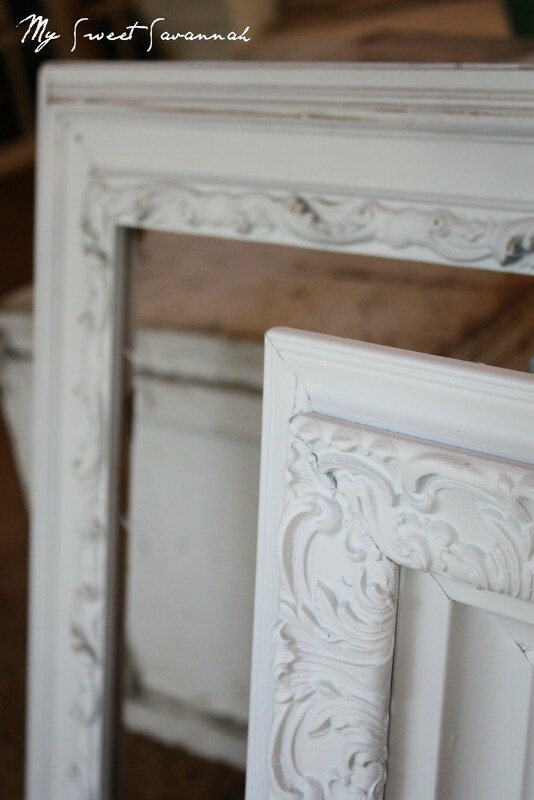 I recently bought these antique frames. and the other was a whopping $3 at a garage sale. I got them out today and gave them the white treatment. and the smaller one into a chalkboard. custom mixed to match the walls in the room. I have been painting for 8 hours straight today. The 20' tall ceilings are a pain in the you know what. I told my son if mommy falls off the ladder and you talk to me and I don't answer, call 911. Anyway, here you see coat 1. 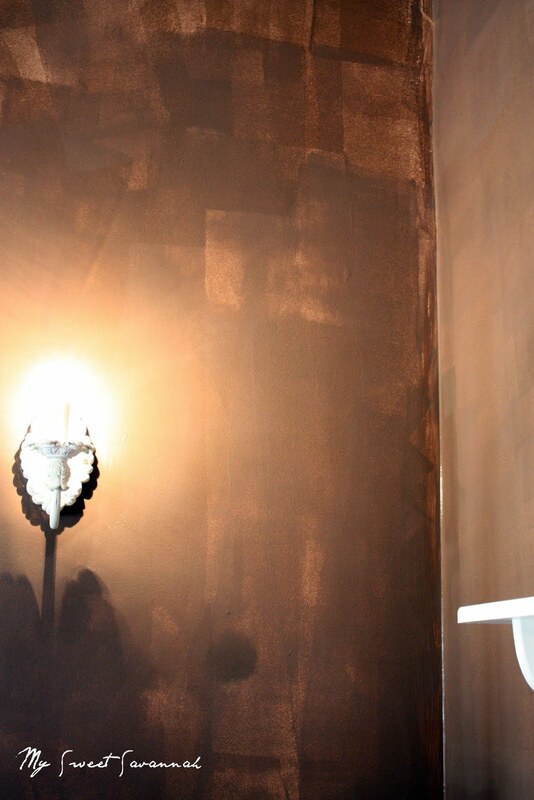 The paint is called Canoe Brown and it's from Lowe's by Eddie Bauer. Here you see coat 2. I am LOVING the color! It looks really great next to the crisp white. so I have to pick up another gallon of that also. Anyway, that's the big exciting news of the day. lower portions of the wall will be painted white. I am loving this series of posts! Looking forward to seeing your progress each day. 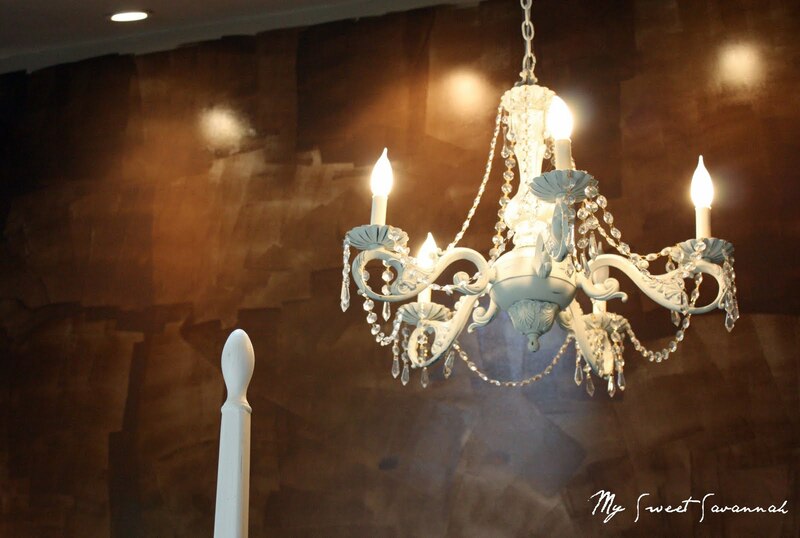 That chandelier POPS against that brown paint, wow! Keep up the hard work. I am wishing my daughter's room was bigger than it's tiny 9x9 size, but I will be thankful when it comes paint time. She will absolutely love the suprise! I love the color! I couldn't imagine painting 20' walls! I painted part of my bedroom earlier and was already getting sick of it and it's not even 8' tall! I can't wait to see the rest of the posts... and just how surprised your daughter is to come home to that! She is very lucky!!! I am so excitd to see the finish project!! So far it looks great!!! Love your blog. Your daughter will be so thrilled when she comes home. How did you do the white treatmeant on the frames? Looking Good! I LOVE that color...great choice!! Look forward to seeing more! Have a fun time with your friend! Love the brown! Btw, is that a peep hole in your daughters door? Too cute!! So far it looks great! Here is the recipe I use to make my chalkboard paint. It is super easy and so much cheaper! Your lucky daughter is going to come home to such a gorgeous and sophisticated bedroom! Bless you once again! It is coming along very nicely. Love those frames. Your daughter is sure a lucky girl. Cant wait to see what you will do tomorrow. You are going to love it! I've had the tan white in my girls' room for a year now and it's so elegant and relaxing. I did mine a bit lighter, it's Lenox tan by ben moore. I have white frames too! 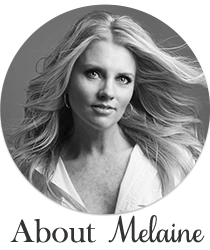 Great minds think alike Melaine! I can't wait to see it when it's done!!!. Awesome, it is looking great so far. I can't wait to see the end result. p.s. be careful on that ladder!! 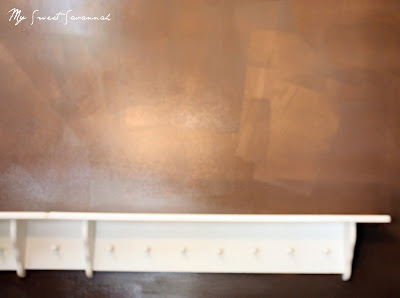 I love the cork board idea in a chunky frame...I did one a few months back and actually just finished another one over the weekend that I put in my daughter's room.....can't wait to see the finished paint job...love the color! That is a lot of painting! 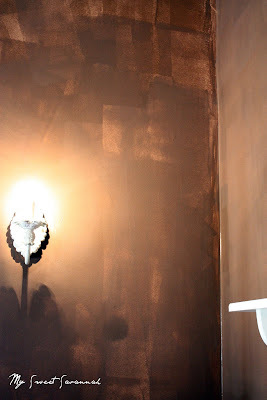 I have tall walls and it is a chore to paint but rewarding when done. You have to try the Kilz Colors paint at Wal-Mart. I no longer buy any other paint as it covers in one coat for regular colors and 2 coats for dark colors. I painted a giant red wall with 2 coats. Love the brown you picked out!! I love the brown, too! It looks fabulous. That's going to look amazing! I painted my 12 year old's room a chocolate color from Valspar also! (chestnut) It barely needed a 2nd coat, luckily for me even though I was painting over a pastel. Seeing her reaction will make all your hard work worth it! OMGoodness, we have 20' walls/ceiling in our family room. I refuse to get on a ladder that high up. LOL We just recently had the room painted and I was a nervous wreck watching the painters on those ladders. Crazy! Can't wait to see it all come together. Love the chocolate color. Our current house has high 20' walls and I want to paint again but am so afraid on the ladder that high. 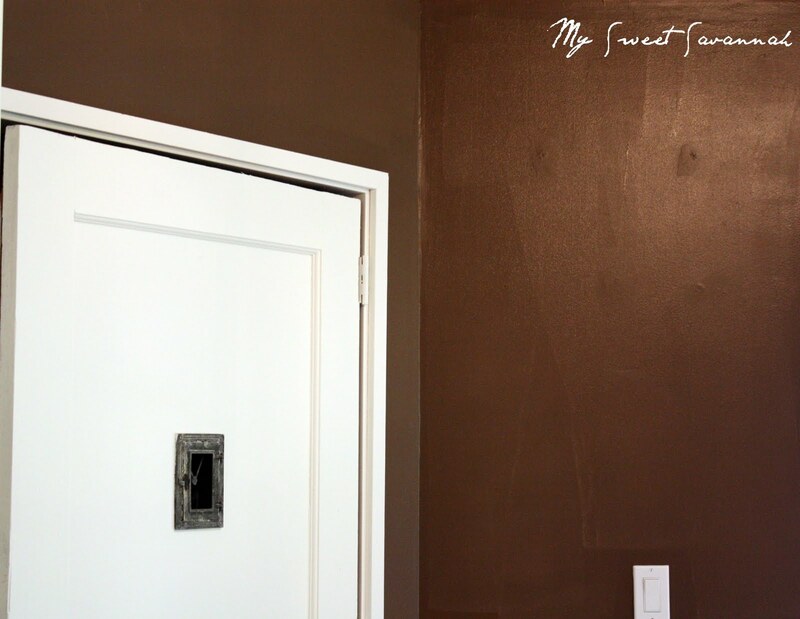 I joke with my husband we need to move to a house with 10' walls so I can change the paint more often :) Love the color you chose it looks great! Love love love this room. You are an inspiration for sure!!! I have a chandelier that I think will go in my office after seeing yours. Wonderful! What an inspiration you are! Love everything about the room.